The successes of 1988's arcade brawler Splatterhouse were almost entirely due to its shocking portrayal of over-the-top violence and gore. But in the two decades since its release, video games have gone on to master the art of highly realistic, explicit violence in frighteningly creative ways. Fragmenting bodies, vomit-inducing injuries and strategic dismemberment are just a few of the developments of gaming's Gib Generation. 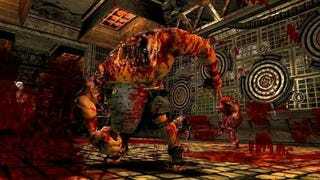 So how will 2010's reimagining of Splatterhouse set itself apart from all of that blood, all of those body parts? For starters: Steaks. I couldn't help but notice, while watching Splatterhouse producer Dan Tovar play through a section of the game last week, how meaty the sounds were during combat. "It's critical to the atmosphere, to the action, to the impact of feeling all of the action, feeling all of the hits," Tovar said, when I asked him about it. "Besides the teams that we have working on the blood and the deformation, the organs, the internal stuff that you see, we have a whole special group of guys just working on the sound effects; a composer working on the music, the stingers, the shock moments." But how did they get that sound? Steaks, lots of steaks, and slabs of beef, it turns out. Tovar tells me that the audio team spent quite a bit of time abusing meat, hitting sides of beef with bats, punching it, throwing raw steaks against walls. But the producer is more interesting in showing me what those juicy sounds signify. Most often the sound of knuckles slamming into meat comes when Rick, the transformed teenage star of the game, is tearing into the monsters of the mansion he's searching for his kidnapped girlfriend. The new Splatterhouse kicks off with Rick and his girlfriend Jennifer going to Dr. West's mansion to write an article about their teacher. But everything goes haywire and Rick gets gutted. While lying on the floor dying, an artifact knocked to the ground during the fight gets soaked in Rick's blood and a demon awakes inside it. The demon mask strikes a deal with Rick, saving his life and giving him powers that essentially turns him into a monster. "So the mask and Rick have this sorta co-dependent relationship basically," Tovar said. "The mask is inhabiting Rick's body and Rick would die without the mask, so they are completely stuck with each other at this point. "Rick would have lost his mind earlier on in the game as a normal human, this stuff would just break your mind and cause you to go crazy. The mask is keeping him sane but it's also teasing and torturing him all along. It's exposing the story to the player and to Rick"
The original game, Tovar points out, didn't have much of a story. You had to read the manual to get any kind of information. But don't think this is a story-driven game. "So the main tenet of the game is more blood more power," Tovar said. The bloodier an attack is, the more powerful Rick grows. Eventually, Rick is able to unleash a "splatter kill" that eviscerates an enemy and sends blood splashing onto the screen. And as with the original game, the Splatterhouse remake is packed with weapons like 2-by-4s, shotguns and cleavers. You can even "weaponize" an enemy, which is a fancy way of saying tearing off a body part or head and beating people with it. And the enemies aren't the only things getting torn apart in Splatterhouse. The hulking, mask-wearing teen can also be torn apart, something that Tovar described as real-time deformation. "Basically his whole shoulder will get torn away, his whole torso," he said. "He will be exposed down to the ribs, his spine. He can get his arm ripped off, but it's mostly restricted to the upper torso." While working on the game, the team played through the original "thousands of times" hunting for the dozen or so characters that are most iconic to include in the remake, Tovar said. "There are three kind of enemies in the game: The corrupted, which are demons that have been spilling in from the other dimension, then there are zombies, which have been brought back to life from the influence from the corrupted and the effect that energy has had on our world, and then there are the things that Dr. West has been experimenting on are kinda roaming throughout the mansion," he said. The game also has huge bad guys, some as much as sixteen times the size of Rick. "You'll wind up having to navigate up their body, up their legs and torso to get to some of the weaker spots on their chest and head," Tovar said. I watched as Tovar struggled with a room-sized eyeball turned on its side. He used Rick to punch the thing every time it opened its eyelid. The eye started turning red, eventually bursting. Tearing open the lid, Rick was able to crawl through into another room. "Everything (in Splatterhouse) is juciy and wet," Tovar said. "Everything is very organic, there are very few normal buttons and switches." Transcription by Aulistar Mark, the amazing intern.